Program 103: Elder Wisdom | Wisdom of the Elders, Inc. Wisdom of the Elders, Inc.
Arlie Neskahi : Today, there is much confusion in the world. Global warming, famine – people search for direction for their families, communities and nations. People search for hope. As a Navajo child, I was taught each people have their own ways and ceremonies given to them to maintain and perform. I was taught to be respectful of each tribe’s vision of the future. In recent times, certain tribal elders have chosen to reveal their visions because they felt their message had global import. In this program, we explore some of these prophecies. The United Nations declared the period from 1995 to 2004 as the International Decade of the World’s Indigenous People. During this decade, the United Nations also created the Permanent Forum for Indigenous Issues, granting a voice to native peoples who have been overlooked since the U.N. came into being in 1945. Barbara Roberts: The tribal elders entered the assembly in their traditional ceremonial attire. At last, they were being recognized – at least symbolically – as representatives of sovereign nations. And they came prepared to deliver a weighty and important message. There were the Mi-Kmaq and the Algonquin from Canada, the Lakota, Iroquois, and Hopi from the U.S., and the Maya and the Huichol from Mexico. To these leaders, the fate of the earth and the survival of the human species were at stake. David Gehue: O Great Spirit, we give you thanks today for the gift of life you have given all of us. We come here today to give a message to our white brothers and sisters so they will hear the cry of Mother Earth, they will hear the cry of the children, they will hear the cry of the animals, they will hear the cry of our indigenous people. Please help us and listen. Hau. …Please welcome the Iroquois delegation. Elders representing the Haudenosaunee, or Iroquois, confederacy approached to address the council. The first to speak was the late Leon Shenandoah, the keeper of the central fire of the Haudenosaunee confederacy for over a quarter of a century, he speaks in his native Onondagan. 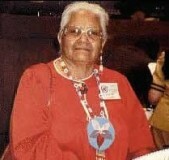 Clan mother, Audrey Shenandoah translates. As we are all gathered here today in this place, it has become our responsibility to bring a message to the people about how we should care for our mother, the earth. Audrey Shenandoah: Our creator has given to us our mother, the earth, from our mother, the earth, comes everything that people need to sustain their life here on earth. Roberts: Leon and Audrey Shenandoah see humankind as part of the earth – much more than mere inhabitants living upon the earth. In this tradition, humankind functions along with the earth as part of a single organism. In mainstream society, we tend to separate ourselves from the elements of the earth. How many of us actually look at the thunder as a trusted and wise family member? Roberts: The Iroquois believe the earth was given to us as a sacred trust, but that trust has been violated. Audrey Shenandoah: Within our prophesies, we are told that all of these things, all of these gifts for which we give thanks to our creator, are the ones who will tell us when the changing of the earth is coming about. For they will be, having been abused, they will be withdrawn from us, and we can no longer depend upon them. Our brother, the sun, who gives us heat and light, will also become something that will begin to take life. From the pollution, in our language of today, the sun will become affected. And human people here on this earth will suffer from the heat of the sun. The crisis will go beyond the material aspects of the earth’s bounty. Iroquois prophesies anticipate spiritual ills within humankind that will erode our ability to communicate with each other. And the people, the leadership, the governments, I will say, of this whole earth will no longer be able to sit together and talk in peace. And this will begin, we are told, in the land far across the big ocean in the land of the white sand. Audrey Shenandoah: The strawberry, the principal of all the fruit, the fruit life on this land, will become scarce. And then one time will come and we’ll not be able to see the strawberry. Then we may use the red leaves, if there are only leaves, and give our thanksgiving still that the strawberry plant is still there, although the berry has not appeared. And this will be acceptable as a thanksgiving to our creator. Roberts: For the Iroquois, the role of women is distinct and critical in averting destruction. Audrey Shenandoah: Our mother earth is crying from abuse and disrespect, and the mothers of the nations of this earth are also crying. I’m speaking about the mothers and the women who still are connected to the things of earth, to the life giving mother earth. That these true ways that were given to our people will live on; that our children seven generations into the future will have clean water, will have clean food to take into their bodies, so that there will be life. We are in very, very difficult times. And it becomes an individual kind of thing for people to change their lifestyle. And in our nation, the women have a very noble, respectful place in our societies. And the women are in the forefront of keeping our traditions, of keeping our ways of life that were given to us in the beginning of our time. And this is the way we are told that it should be. Our leadership do not make decisions without input, without the advise, without consulting with the women within our nations, because the mothers, the women are life givers themselves. The Iroquois believe there is a set of instructions for how to survive. The instructions are the basis for the traditions, thanksgiving prayers and ceremonies that make up the Iroquois way of life. More than 200 years ago, the instructions came to a holy man in a vision, a dream. 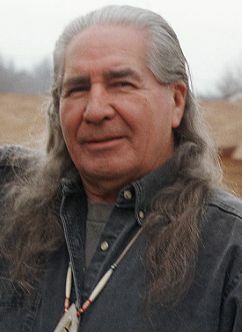 Here is Onondagan faith keeper, Oren Lyons. Oren Lyons: We have what we need to survive. They told us we have our traditional ways, our ceremonies, our thanksgiving – to carry them out. And that’s how our people will survive, no other way. That’s how life will survive. My uncle tells me, and reminds me, that what they said was that by keeping our traditional ways, our thanksgivings, and carrying this out, we are supporting life. That when we stop – when the indigenous nations – stop giving thanks, then things will stop growing also. And the values of food will go down, the value of money will be nothing, and all of the things we are talking about will come about. And so it is up to the people. The other side of this prophecy is the healing. But humankind will have to work together to embrace a collective reality of spiritual health. Here are the words of Mi-Kmaq elder, David Gehue, as read by Lionel Little Eagle Pinn. The circle of the medicine wheel is now complete. The Wabanake people, the people of the light, have joined the circle. We have joined the circle under the following philosophy. You heal the self. You help to heal the family. The family helps to heal the community. The community helps to heal the nation. And the nation helps heal the world. All the prophesies from other nations now coincide and complement each other. It is time for us all to stop blaming one another, then move forward, for the survival of the world as we know it lies in our hands. We must seek out and absorb the wisdom of the elders and use it for the betterment of others. 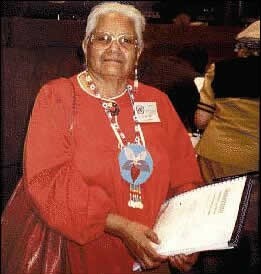 For wisdom of the elders, I’m Barbara Roberts. Copyright ©1993-2017 Wisdom of the Elders, Inc. All Rights Reserved. | Website by ArtNota & Clark Salisbury| Maintenance provided by Marilyn Shawe. Magazine Premium created by c.bavota.